Everybody loves sunflowers - the giant of the garden, and a perky, sunny flower that is the essence of summer. It's fun to watch sunflowers in the morning, at noon, and at night, as they literally turn their "faces" toward the sun. In fact, that's a fun project to document with a camera to show your friends. The fast rate of growth makes for some fun garden math projects as well. Buy sunflower seeds at a garden center, in a packet. Don't plant the grocery store kind. If you want to harvest edible sunflower seeds, check the seed packet to make sure you're not buying a sunflower variety that's prized for its flowers instead of its seeds. Look for a variety that ends up really tall. Plant the seeds in the early spring when the temperatures remain above 50 degrees, perhaps in late April. Improve the soil with rotted manure and compost. Plant seeds according to package directions, about 1 inch deep and 1 foot apart. It's a fun idea to drop a handful of flour wherever you plant a seed, so you can remember where it is and water that spot 'til the seedlings sprout. Using a gentle sprinkle from a sprinkling can, water daily to keep the seedbed moist, but don't flood the soil. Once the seedlings are up, fertilize once a week at half-strength (twice as much water as called for), with a good fertilizer such as fish emulsion, when you water. Once the plants are about 6 inches tall, you can switch to giving them a full-strength fertilizer feeding once a month until harvest time. They won't need daily watering once they're up, but stick your finger as deeply as you can into the soil near the plants, and if it feels dry to your fingertip, it's time to water. It's probably a good idea to also buy a tall garden stake to support the heavy sunflower plant as it withstands high winds and hail. Otherwise, it may easily tip over and break. Wait 'til the sunflower plant is about three feet tall, and push or pound the stake about one foot into the soil about a foot away from the stalk, so that it stands sturdy. You can tie two plants to one stake if you wish. Use soft garden tape or nylon hose to tie the stalk to the stake in two or three places, as it grows skyward. 1. Make a chart; measure the plant's height weekly. You may have to get on a ladder once it gets over your head. Display the growth curve on your chart with some kind of graphic - perhaps a vertical bar chart, to show the rapid rate of growth? 2. Photography practice is always a good idea with sunflowers. They're photogenic! 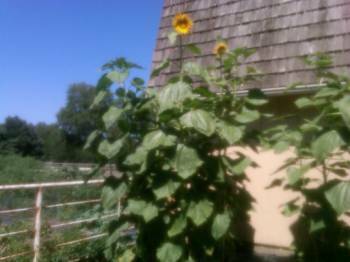 It's humorous to take a picture of your friend towering over a sunflower plant one day, and then two weeks later, it has had its growth spurt, and now it is towering over your friend! 3. It's nice to leave a few sunflowers in place to provide food for the birds. But some people get up on a ladder and cover the flowers with paper sacks until harvest time, to keep the birds and squirrels from eating all of the seeds. It's the leaves of the sunflower plant that give it its food, so covering the flower is no big deal, once it has opened up. The seeds are ready to eat when they are pretty loose on the flowerhead, so give them a wiggle. Sunflowers are usually one of the last plants to be harvested in the garden. At the end of the growing season, cut off the sunflower heads with a foot or two of stalk on each, in case you want to display them as a flower arrangement, and then harvest the seeds. All you have to do is knock them off with your thumbnail! First, though, estimate how many seeds you think are on each flowerhead. You can count the seeds in an area that's about one inch square. Then measure the diameter of the flowerhead, estimate how many square inches are on the flowerhead, multiply by the number of seeds in that one square inch test area, and make your estimate that way. Then count, and see how close you came! You can save some flowerheads intact for craft projects or as autumn decorations, and crack the shells and eat the seeds of the rest, rolling them in a little salt. Mmmmm!